The most iconic buildings in Toronto aren't necessarily the oldest or the most architecturally significant, but instead the ones that we immediately think of when we call to mind a certain neighbourhood. These are the buildings that frame Toronto's psychogeography, and exist as touchstones that help us to navigate the place we call home. Here are my picks for Toronto's most iconic buildings divided up by neighbourhood. 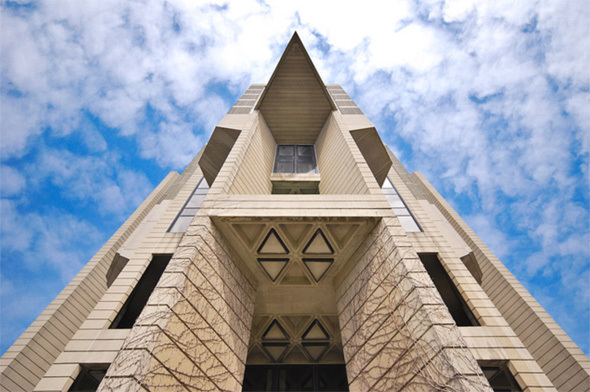 Robarts Library, Butalist icon. Photo by Jared Krause. The Annex is home to plenty of lovely bay-and-gable homes, but the building that garners the most attention and discussion is surely Robarts Library. Built in 1973, the Brutalist giant is one of the most recognizable buildings in the city. Vintage theatre charm in the Beaches. Photo by Ryan Couldrey. Frank Gehry's AGO renovation still shines on Dundas. Photo by Ferit Onurlu. Prior to Frank Gehry's revamp of the AGO, the concrete building didn't attract many fans, but its now become an architectural centrepiece in the city, marked by the stunning Galleria Italia that faces Dundas St. West. The Village Green remains on of Toronto's nicest mid-century apartment towers. Photo by Rick McGinnis. The Village Green is one of the nicest 1960s era apartment complexes in Toronto, but it's the circular centrepiece - often dubbed the "Vaseline Tower" - that warrants iconic status for its novel shape and important role in the history of the Village. Toronto's Cube House in all its glory. Photo by Derek Flack. Many passing by still wonder what the hell the strange structures near Eastern Ave. and Sumach are, but architecture buffs know that they're a Canadian version of Piet Blom's Cube Houses built by architect Ben Kutner and partner Jeff Brown in 1996. Yes, someone does indeed live there. Once a theatre, now a live music venue. 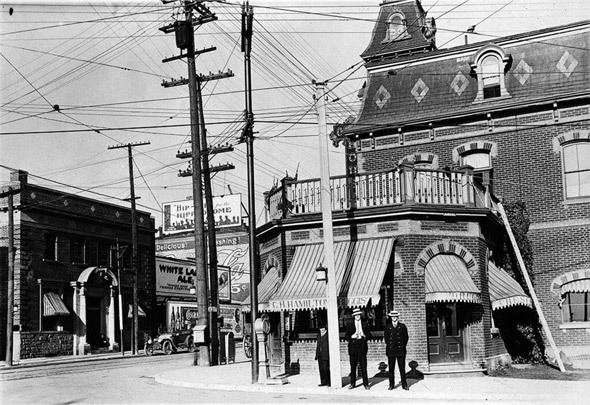 The Danforth Music Hall has stood the test of time. Photo by Dennis Marciniak. Opened as Allen's Danforth Theatre in 1919 shortly after the construction of the Bloor Viaduct, the Danforth Music Hall become a live musical venue sometime in the 1970s, which gave the building a new lease on life that's lasted until today (despite a few hiccups along the way). 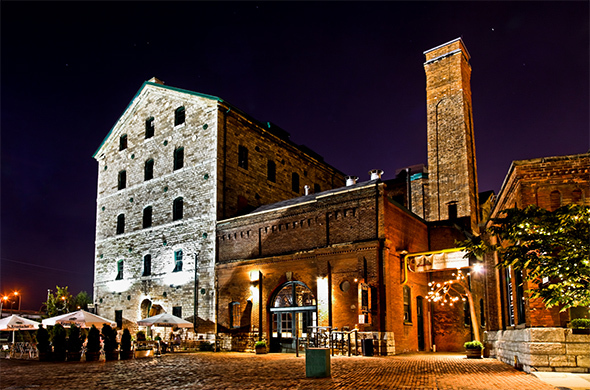 Some of Toronto's oldest buildings can be found in the Distillery District. Photo by Benson Kua. The whole district is a Toronto icon, but the Stone Distillery dates back to 1859 and is one of the oldest buildings in the entire city, so certainly worth an extra nod of attention. This building used to be right on the water when it was first built. It's incredible that it remains in such great condition. 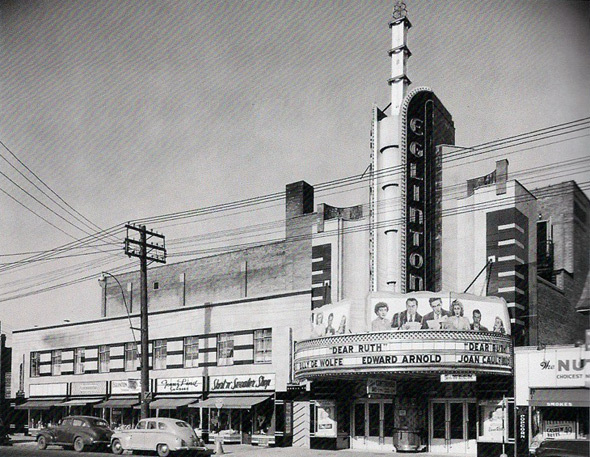 It's no longer a cinema, but the Eglinton Theatre is still an icon on Eglinton West. Photo via the Ontario Archives. 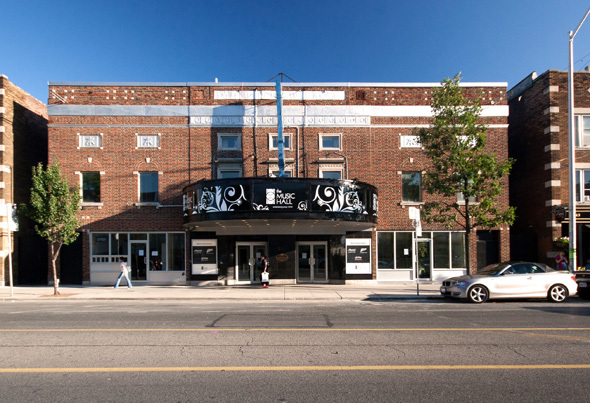 The Eglinton Theatre is an Art Deco gem from 1936 that's been preserved through its use as an event venue. While it no longer advertises movie titles, the outstanding marque is still a fixture of the building, as is the sign which can be seen for kilometres when traveling along Eglinton Ave.
Not a building, but the Humber Bay Arch Bridge is one of Toronto's most iconic structures. Photo by ~EvidencE. I'm going to cheat here a bit and nominate a structure rather than a building as Etobicoke's most iconic contribution to Toronto architecture. Why? 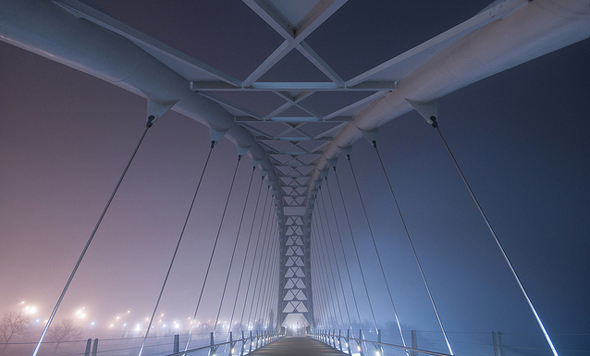 Because the Humber Bay Arch Bridge is one of the most photographed places in the city and synonymous with the former borough. 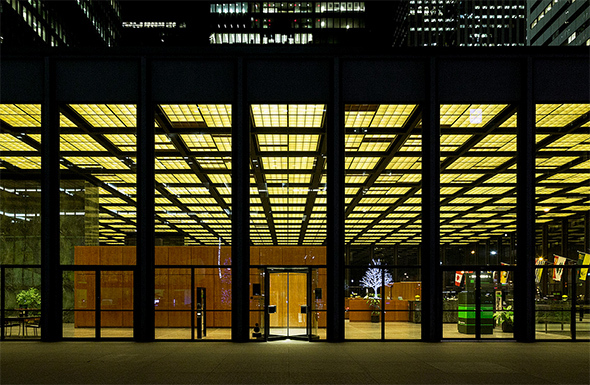 Mies van der Rohe's TD Centre is still Toronto's classiest building. Photo by Vik Pahwa. This area is filled with important skyscrapers, but none so much as the Mies van der Rohe-designed TD Centre, which helped to modernize Toronto architecture and gave birth to Financial District that we know today. The Harbour Commission Building is being swallowed up by taller buildings, but it's still a beauty. Photo by George Socka. Amidst the wall of condos that lines the waterfront, the now-small seeming Harbour Commission Building is a throwback to the area's history. It's an elegant Beaux-Arts building that once sat at the end of a pier at the southern most tip of downtown Toronto, but which has now been subsumed by development. The Campbell Block has been restored to its old glory (mostly). Photo by Derek Flack. The Campbell Block serves as something of an entranceway to the Junction. Completed in 1888 to the designs of architect James Augustus Ellis the building had fallen into into disrepair until a recent restoration revealed its former glory (even if they got a few details wrong). The Tower Automotive Building is as elegant as old factories come. Photo by Hector Vasquez. Soon to be the future home of MOCA and the centrepiece of a burgeoning neighbourhood, the Tower Automotive Building hovers above the Lower Junction Triangle as a monument to our industrial past. The King Eddy is everything an old hotel should be. A collaboration between Chicago architect Henry Ives Cobb and E.J. 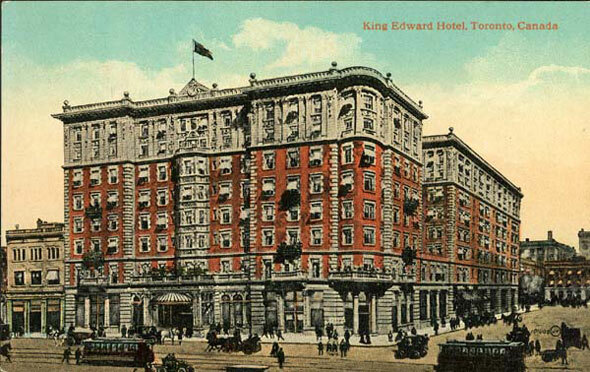 Lennox (of Old City Hall and Casa Loma fame), the King Edward Hotel opened in 1903 and has remained one of the most stately in Toronto. Originally opened with 400 rooms, an addition in 1922 brought the number up to over 500. 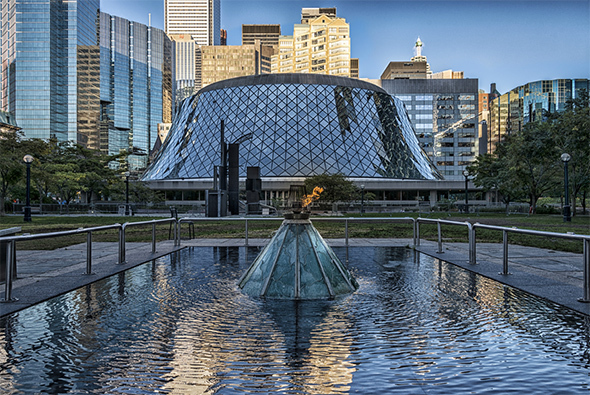 Roy Thomson Hall is one of Toronto's best buildings from the 1980s. Photo by Ben Roffelsen. 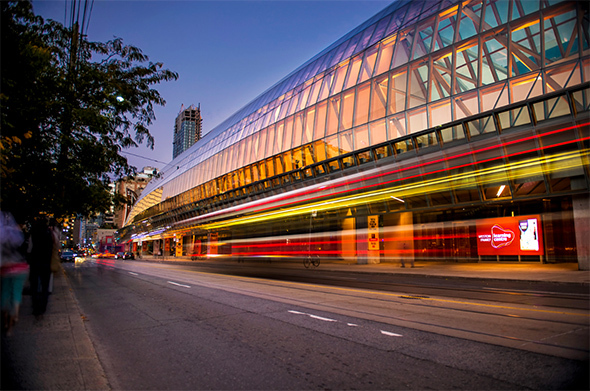 The Royal Alex Theatre gets the nod on King West for most iconic historical building, but it's the rounded Roy Thomson Hall that takes the cake here. Built in 1982, the Arthur Erickson-designed concert hall was an instant icon. 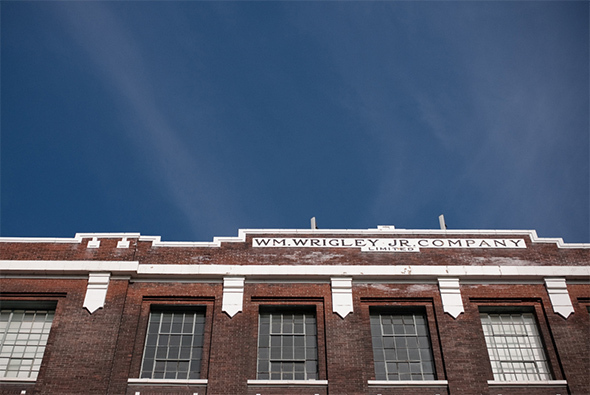 As far as loft conversions go, the Wrigley Lofts are heard to beat. Photo by Bryson Gilbert. Once home to the Wrigley Chewing Gum company, this industrial-relic-turned-loft-space dates back to 1917. It's brick exterior still cuts an imposing figure on Carlaw Ave, though the interiors are chic as can be. Warehouse architecture at its finest in Liberty Village. Photo by Frank Lemire. 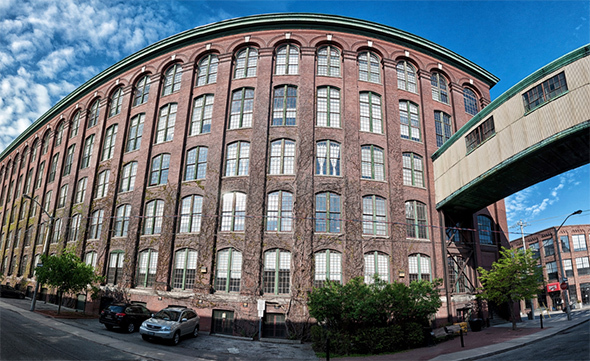 Dating back to the early 20th century, the Carpet Factory is the poster child for adaptive re-use in Liberty Village. The sprawling building covers 310,000 square feet, which is now used for modern offices. Walking alongside the exterior along Mowat Avenue can feel like you've entered a time warp (in a good way). The marquee at the Royal is a reminder of an earlier time. Photo by William Kimber. . The Royal Cinema is an excellent of Art Moderne design (i.e. late Art Deco). 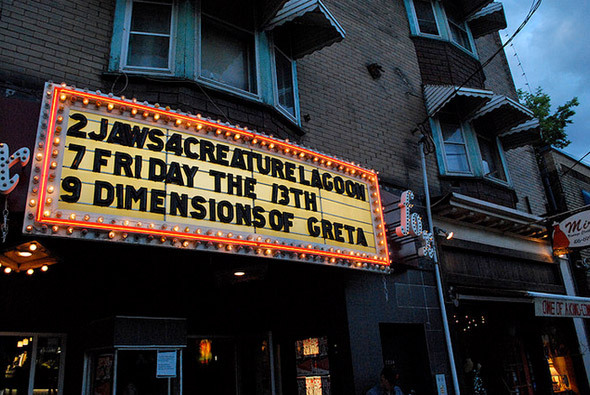 Opened in 1939, the cinema has had a variety of names, but its distinctive marquee has been a fixture on College St. for the long haul. The sign has seen its better days, but the Mount Pleasant Theatre is still a gem. Photo by Michael Newman. Mount Pleasant is home to two historic movie theatres, the Regent and the eponymous Mount Pleasant Cinema. The latter is the more recognizable of the two, however, thanks to its bright neon sign. It opened in 1926 as the Hudson and was subsequently renamed in 1951. The Bergeron Centre has helped to change York's architectural status. Photo via ZAS Architects. It's the youngest building on this list, but the ZAS Architects-designed Bergeron Centre at York University has already eclipsed the competition for most iconic building in North York. 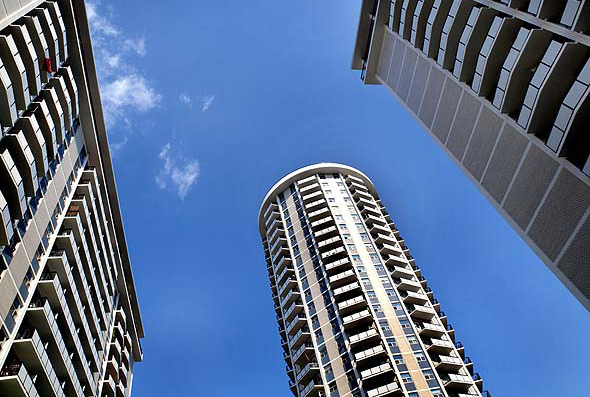 "The Cloud," as it is affectionately referred to, is a marvel of contemporary design. Its current tenants notwithstanding, the beauty of the Ocean House Hotel building can still be seen if you squint. Photo via the Toronto Archives. The building is certainly worse for wear, but if you squint a little, you can still see signs of the former Ocean House Hotel's former glory at Queen/King and Roncesvalles. The building dates back to 1884 when it was an upscale inn for those entering Toronto from the west or inner city vacationers looking to take advantage of its proximity to the lake. 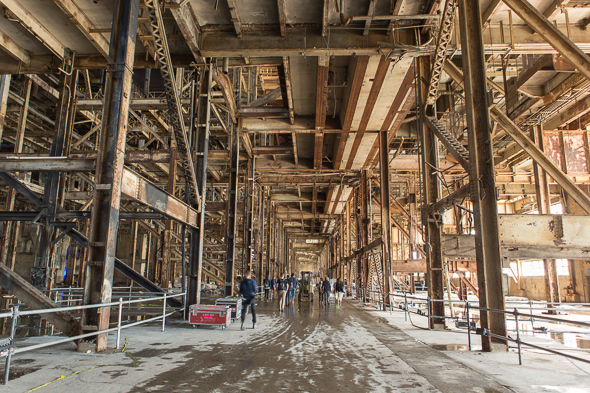 Regardless of when the public next gets inside the Hearn, it will always be a remarkable building. Photo by Andrew Williamson. The towering Hearn Generating Station has returned to the city's collective consciousness after playing host to this year's Luminato Festival. The hulking former power plant has returned to life as a film set, but there's still hope that it'll host future public events if fire code issues can be sorted out. 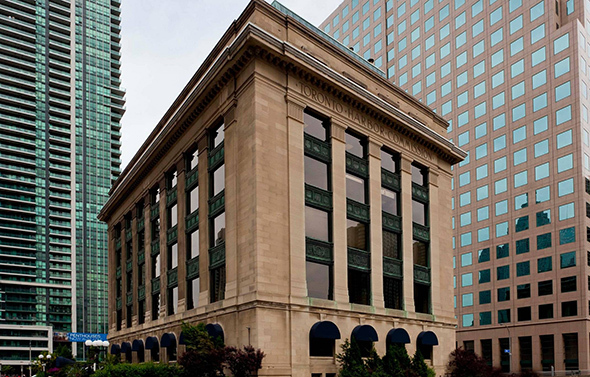 299 Queen is one of the city's most culturally important buildings. Photo by William Kimber. 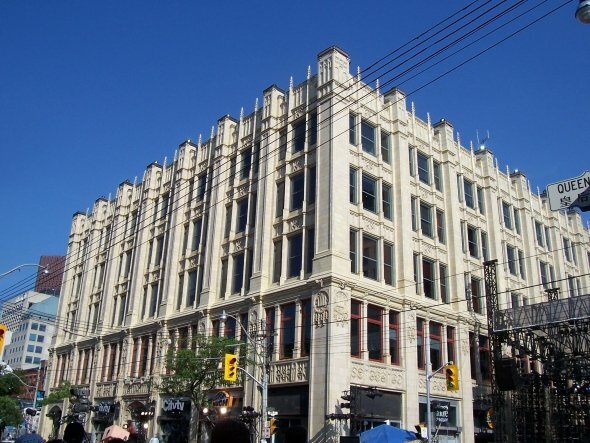 The most iconic building on the street named Queen West is undoubtedly Viljo Revell's City Hall, but if you're thinking of the neighbourhood's centrepiece rather than the city's as a whole, that would have to be 299 Queen Street West, former home of MuchMusic and Citytv. Immaculately restored, the Broadview Hotel is the centrepiece of Riverside. Photo by Hector Vasquez. 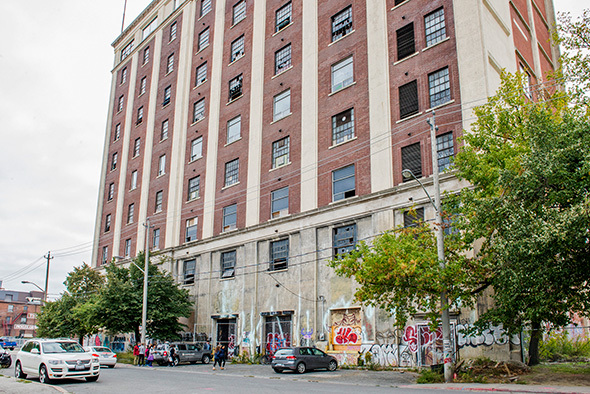 It's currently in the midst of a transformation and major additions, but the Broadview Hotel remains the landmark building in this neighbourhood, and will likely only become better known as it begins its new life as a boutique hotel, venue, and restaurant destination. 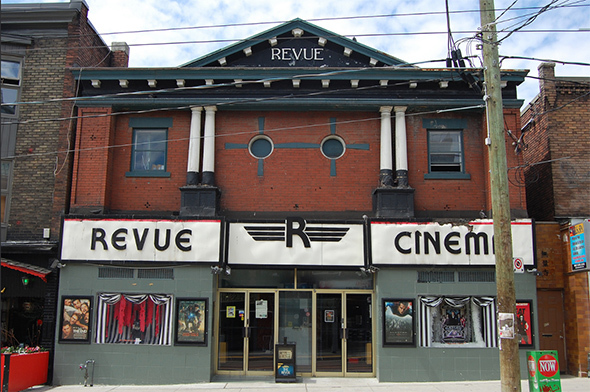 The Revue is Toronto's oldest movie theatre. 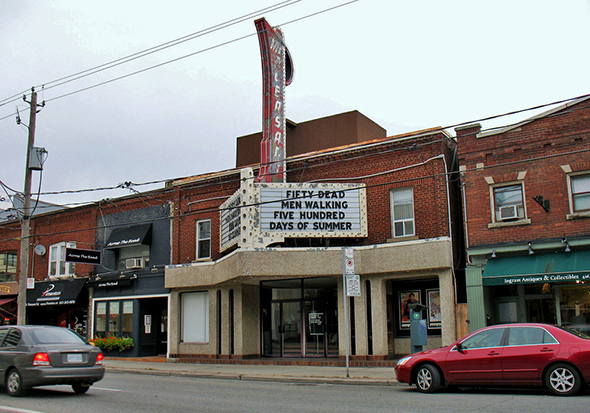 Toronto's oldest cinema somewhat tragically lost its marquee in 2007, but more importantly the Revue managed to keeps its doors operating as the longest standing cinema in the city. 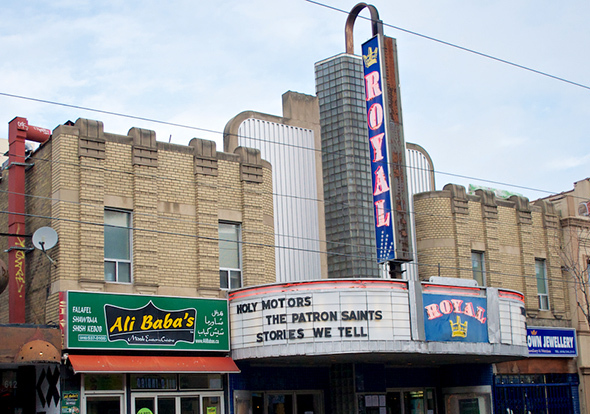 Even without the marquee, the building is the neighbourhood gem. One of Toronto's best adaptive re-use projects. Photo by Sean Go. 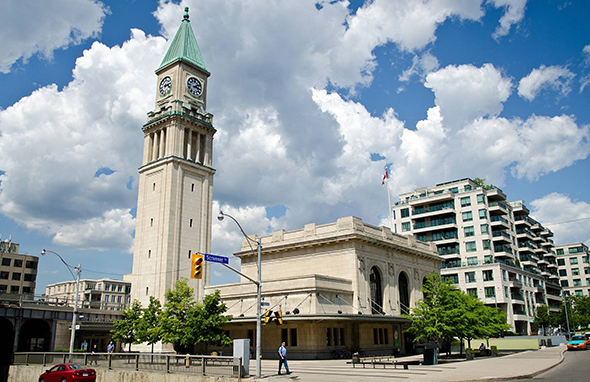 One of the most gorgeous buildings in the city, the former North Toronto Railway Station now serves as the LCBO's flagship location. The design is based on St Mark's Campanile in Venice and dates back to 1916. It only operated as a train station until 1930, though a restoration in 2004 preserved many of its original elements. The Scarborough Library is Toronto's nicest new branch. Photo via Blackwell. 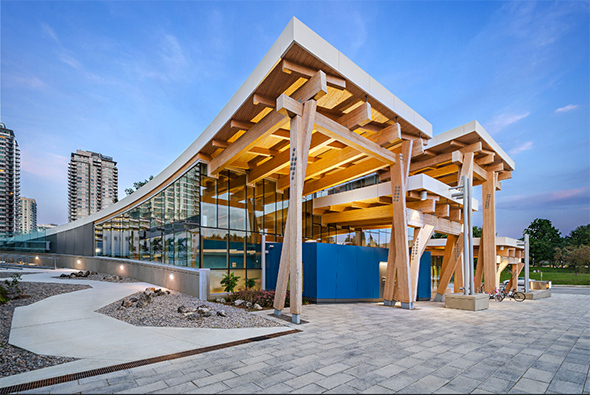 Not so long ago the Scarborough Civic Centre would have ranked as the former borough's most iconic building, but that title now goes to the adjacent library recently opened on the same site. The dramatic wood-framed building is a stunning bit of architecture that improbably complements the older Raymond Moriyama building. The Wychwood Barns are a major cultural hub. 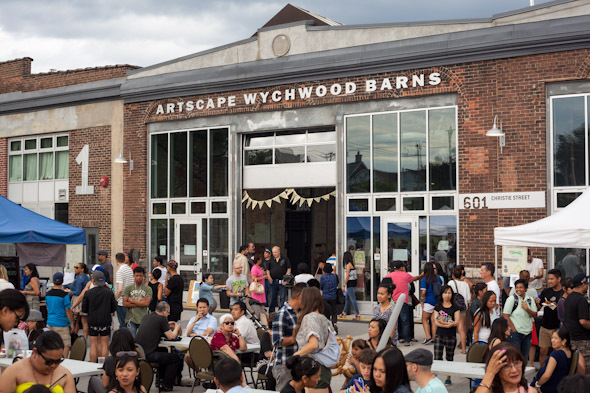 Formerly a TTC streetcar maintenance facility, the Wychwood Barns helped to establish Artscape's reputation for artist-focused redevelopment. The complex blends historical and contemporary design to act as neighbourhood hub that's both practical and pleasing to the eye. No surprises here. 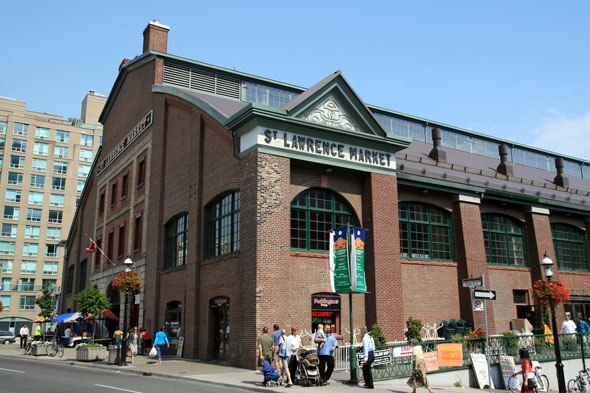 The St. Lawrence Market is the foundation upon which the surrounding neighbourhood is built. Established in the early 19th century, the current building dates back to 1904 and was renovated in the 1970s. 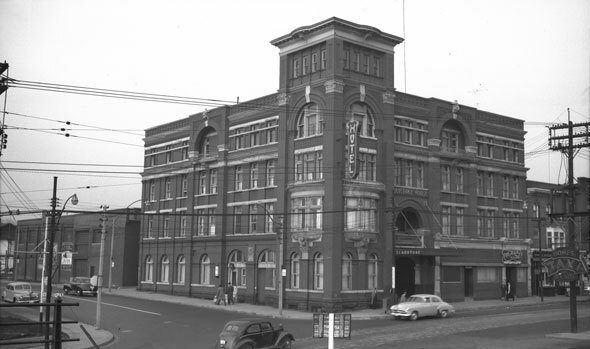 The Gladstone in the 1950s. Photo courtesy of the hotel. The Drake Hotel might be the busier spot, but the Gladstone Hotel is the most iconic building along West Queen West for its longer history and Romanesque architectural legacy, which has been far less altered over its century plus existence than its neighbour. 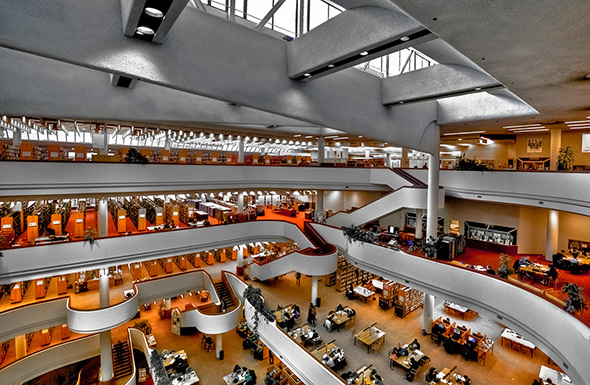 Looking into the atrium of the Toronto Reference Library. Photo by photoanalysis. Built in 1977, Raymond Moriyama's Toronto Reference Library has always been defined by its soaring atrium, but perhaps the greatest pleasure of the building is its northeast side, where (mostly) indirect sunlight pours in and vistors can gaze out upon lush Rosedale. The re-created marquee at MLG. Photo by Derek Flack. 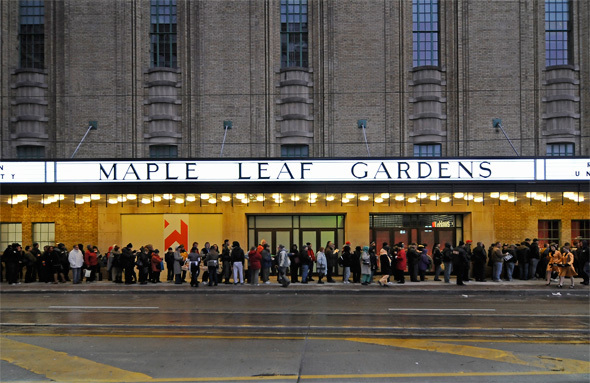 The idea of opening a grocery store in Maple Leaf Gardens was cause for much controversy when it was first proposed, but the joint occupation of the building by Ryerson and Loblaws meant that the building would still be home to a hockey rink and the great cathedral-like ceiling would remain in place.. 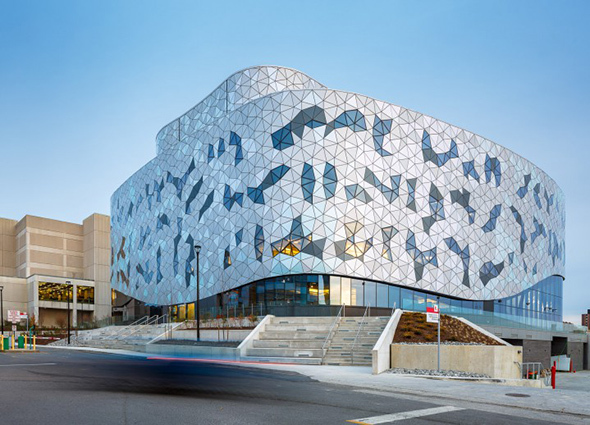 The Ryerson Student Learning Centre is a showstopper. Photo by Vik Pahwa. 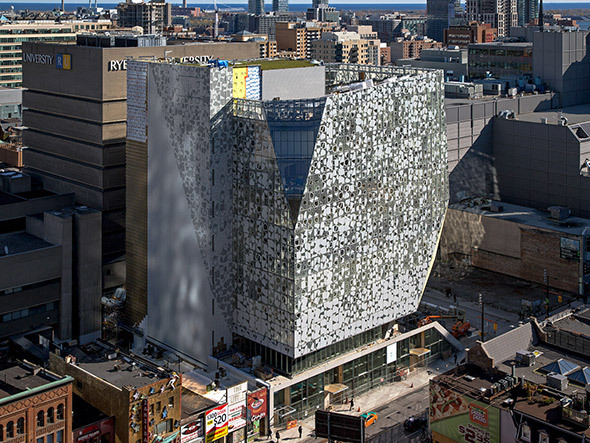 The Eaton Centre is the old standby at Yonge and Dundas, but the new Ryerson Student Learning Centre has a much better relationship to the street, and for it will now wear the crown of most iconic building in the area, even if the title is a ad premature.